This book has the potential to save your life. Magnesium has been used around the world to bring people back from the brink of death and Dr Mark Sircus examines how this amazing mineral that is so overlooked by the majority affects so many aspects of our health including cancer, heart disease, diabetes, depression, asthma, inflammation, arthritis and autism. If you want to learn a powerful healing system designed by nature, what the best form of magnesium is and how to take it at higher doses than is possible by oral means alone then this book will answer your questions. This book provides everything one needs to learn about magnesium medicine. Magnesium can be administered orally, transdermally, intravenously, it can be nebulized directly into the lungs, added to baths and even used in enemas. The water we drink ideally also would have a high magnesium content. Doctors are familiar with using magnesium chloride as a medicine which can be administered to a patient while they are having a heart attack or stroke to great effect. In light of the fact that most of us are magnesium deficient and that without sufficient magnesium our bodies are unable to function correctly makes information about magnesium medicine crucial--information that no one can really afford to miss. This is what Dr. Sircus considers his professional edition of this work, which is also available in hard copy in its original form. 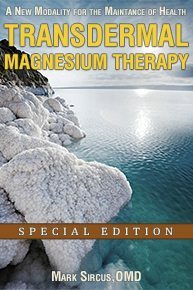 This ‘special edition’ of the Transdermal Magnesium Therapy book is not just about transdermal magnesium but all forms and methods of administration. Magnesium is essential for vibrant health and cannot be manufactured by the body leaving us responsible for providing enough. Almost all of us need to be doing better with our magnesium intakes because it is required by more than 300 chemical reactions including proper muscle and nerve function. Even a mild deficiency of magnesium has noticeable health effects. Most of us are very familiar with taking medicines and supplements orally though there are also many medicines now given transdermally (direct absorption through the skin). Popular examples are nicotine patches, hormone patches and many others. The advantages of transdermal absorption are varied including the direct application of medicine over an area of pain, the more rapid entry into the bloodstream, bypassing the digestive tract where it can be reduced in its effect by enzyme and acid actions, and increased absorption and bioavailability. In the case of magnesium it can reduce the common side effect of diarrhea that is the single-most limiting factor to increasing our magnesium levels sufficiently. Taken orally, only 30-40%% of the magnesium is actually absorbed possibly less Dr. Jay Cohen, MD, states that "When you take magnesium tablets or capsules, your body absorbs only 30 percent of the magnesium they contain. With many top-selling products, absorption is much less, as little as 10 percent."